- ‘Infinite’ adjustment with hand knobs on either side. The Brill Mower is a great machine. 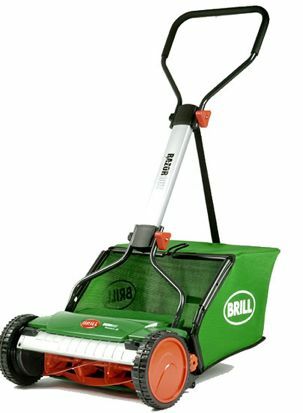 Brill makes some of the best push reel mowers on the market today, incorporating such features as light weight and no contact ‘silent’ reels that add durability to the product. Brill also sells models with an electric motor powered by a rechargable battery to help male mowing easier. The Brill Reel Mower weighs in at 15 to 17 pounds, depending on the model selected. This is by far the lightest push mower series on the market today. (In contrast, the Scotts Classic mower weighs an impressive 30 pounds). The hour glass handle allows for easy maneuverability. Every Brill Reel Mower has the ‘silent’ no contact blade design. This offers several advantages over ‘contact reels’ to include less noise, less effort required to push the mower, and longer blade life allowing for less frequent sharpening. Brill recommends the blades be adjusted yearly, and a handy gauge is provided to get the job done easily. The cutting blades are flame hardened steel to help hold a good sharp edge, and are welded ( not riveted) to the support reel. Ball bearings come standard. A traditional rear roller assembly is found in the back of this beauty. Brill considers a low cut lawn ideal, with cutting height ranging from 0.7 inches to 1.8 inches - a little on the low side for those living in dry climates with Kentucky Bluegrass. A 7 inch wide metal cover is mounted on the front of the mower, to prevent unwanted objects from entering the blades while mowing. For those homeowners looking for a light weight push reel mower with added durability of long lasting cutting blades and a close-to-the-ground cut, nothing beats Brill. This line of machines will cost more initially, but the savings realized by the less frequent sharpening costs will make up the difference over the years. The cost? About $210.00 - $230.00.